I am currently repeating an experiment performed by Joe Khachan and Matthew Carr in Sydney, Australia. 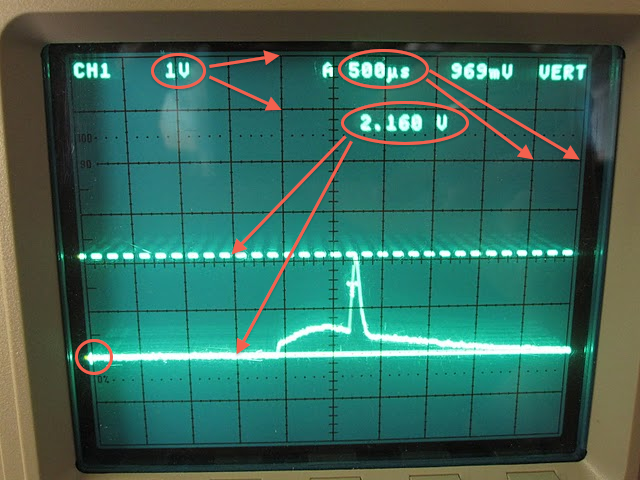 The coils were driven by a pulsed current power supply that consisted of a 7.5 mF capacitor bank, which could be charged to a maximum voltage of 450 V….A maximum peak current of 2.5 kA was achieved. We are seeing an effective resistance of ~0.45Ω compared to their 0.18Ω. We need to lower the resistance and increase the voltage. With 800V we get 1300A. More current, but effective resistance increases to 0.61Ω. OK fine. Lets try lowering the resistance with a dummy coil directly connected to the power supply. 45 turns 6cm diameter. The Polywell coil is same size but 15 more turns. Now we are clearing 2.5kA with 600V! But look at the strange pulse shape. Hmm. So clearly delivering current will be a design challenge.